They were four middle-aged men who seemed to have it all. Wealth. Power. Fame. Their names and likenesses appeared on every conceivable piece of merchandising...even a mountain and town were named after them. 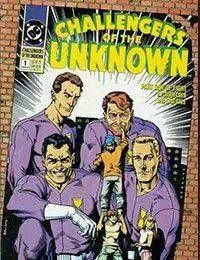 All this adoration is based on a long-ago event and the illusion of the four men--Rocky Davis, Ace Morgan, Red Ryan and Prof. Haley--the team the world knows as the CHALLENGERS OF THE UNKNOWN. Unfortunately, in a single devastating instant, all their fame and popularity is destroyed when an experiment conducted by Prof. Haley seemingly goes wrong, destroying Challengerville and the theme park, killing hundreds along with Prof. and his assistant, June.<br />The Challengers are living in their own mountain, with a town that practically worships them. Then the mountain explodes, killing many towns people and seemingly, Prof and June.